We remove bats in Scottsdale, Cave Creek, Phoenix, Mesa, Tempe, Desert Hills using exclusion devices, not bat traps, or poison. We are not bat exterminators. Call us today for a free Bat Inspection and price quote! Arizona has its share of pests, including bats! They will get into the smallest cracks of a home, and poop and pee all over the wood and insulation in an attic. The screeching noises, and fluttering sounds are irritating, but the scratching sounds are truely frightening! This is a good time to call our Bat Removal professional and have it checked out! 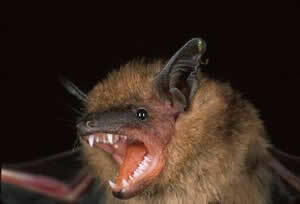 Bats have the ability to catch and chew bugs, thats about it, so your structural and electrical worries can rest easy! We dont use bat traps. We use exclusion devices, netting, and sealants to bat proof a home in Arizona. Its easier to get bats out alive than dead. If we kill bats in Arizona, we are not just breaking the law, we are also causing a bigger problem than you started with. The dead smell from hundreds of rotting bats will soon drive you out of your own home! Dont kill bats, they are good for the environment, just not in your home! There is no known substance that can be sprayed and repel bats like a mosquito. We get bats out, and seal the building to bat proof it with materials that will be there 50 years from now! We do bat removal seven days a week! Call us for affordable Bat Removal in Arizona toll free!